The Number Systems and Operations of Arithmetic was written for the single purpose of explaining to elementary school teachers (both in-service and in-training) the nature of those basic principles of mathematics which form the foundations and structural framework of arithmetic, and how the familiar formal algorithms of arithmetic stem from these structural principles. The book is organized into two parts. 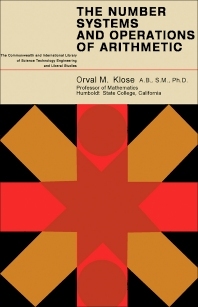 Part I on number systems covers the origin of numerical thinking; natural operations with the natural numbers; natural laws for the natural operations; the inverse operations and convergence and the number systems generated by these operations; and classification of the number systems as abstract systems. Part II on computational algorithms discusses computations with natural numbers, rational numbers, real numbers, and complex numbers. The ""answers"" to all the exercises are also provided in the main body of the text and it is hoped that the student will form the habit of looking there for them.